STILLEN Hi-Flow Catalytic Converters - Dezod Motorsports Inc - Home of the automotive performance enthusiast since 2002. 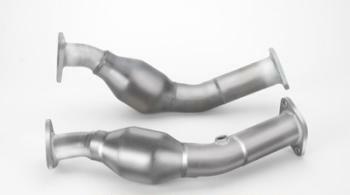 STILLEN now has high flow replacement catalytic converters for the Nissan 350Z, 370Z, Infiniti G35, and G37 Coupe. These are for the enthusiast that wants the best flow possible, while remaining environmentally responsible. Though these converters are not CARB legal, they are a step above race or test pipes and will result in a less “raspy” tone. As high performance cats, some sound increase should be expected. STILLEN Hi Flow Catalytic Converters reduce emissions and unpleasant exhaust smells.